Hammocks have been used as a place to relax or sleep for so long that no one can be sure where the first ones were employed. They are frequently staple sleeping arrangements in warm climates, and they were long used in sailing ships as bedding for the crew. They were a traditional part of the Victorian garden, especially with soft pillows and a crocheted blanket. Modern hammocks come in all sorts of fabrics, from simple mesh or cotton right on up through parachute fabric. With a supporting stand, they can be hung almost anywhere, including indoors. They can even serve as a spare bed. There are few things that say summer sun and relaxation quite like a beautiful canvas hammock on a wooden stand. If there are snow drifts outside, then your hammock will be right at home in your sunroom. The stand is constructed of weather-resistant larch, and the hammock is made of Sunbrella cotton which is durable enough to stand up to outdoor weather, including alternating rainstorms and strong UV rays. The wooden parts are bolted together, the hammock is strung with light chains and lanyards, so you don’t have to worry about roped that can wear and fray. Each end of the hammock dowels is tethered. This helps keep the hammock from flipping, or from being worried by the wind. Pretty striped polyester fabric hammock on a metal frame offers a comfortable place to snooze in the sun, either solo or with a companion. The blue, white and teal stripes make a soothing color combination that can lend understated style to your outdoor areas. Designed to hold up to two adults, its weight capacity is 350 pounds. It comes with a pillow and hanging chains and is dye treated for sun resistance. It is an excellent hammock to take camping and can be set up inside or outside your tent. According to some hammock and camping experts, this is the best sort of hammock. 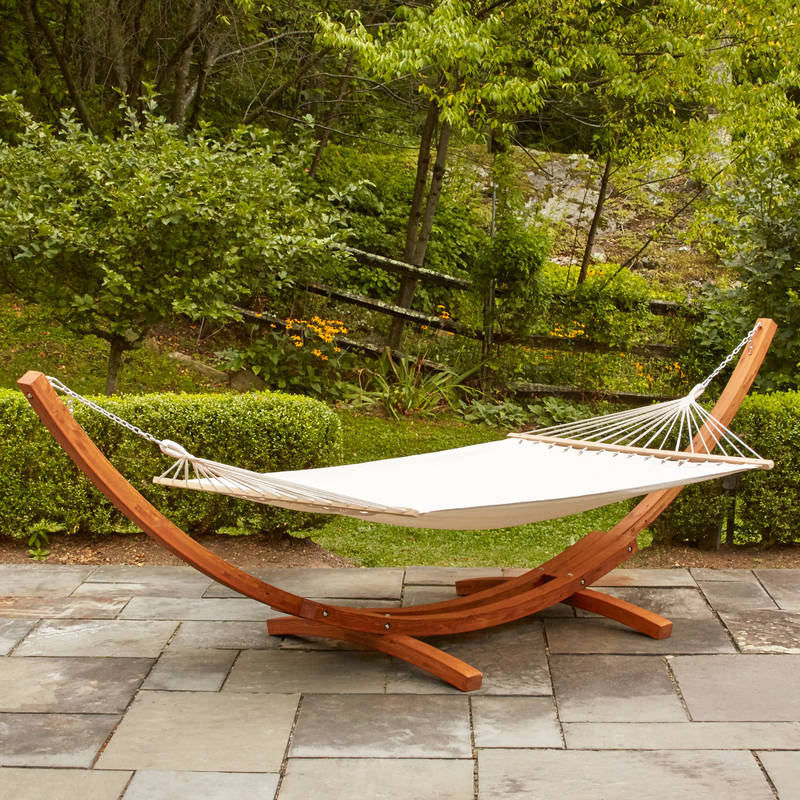 Spreaders, which are intended to make a hammock lie flat like a bed, can encourage flipping or spinning. That is why the tethers for the tree hammock are a favorable feature. Hammocks without spreaders allow the user to lie across the hammock, making it behave more like a hammock chair. This model comes with a frame that has several hooks, allowing the user to select how low the hammock should hang. The frame also has a U-shaped rest for the strands of the hammock tethers, which allows the strands to spread somewhat, discouraging the spinning and flipping that makes some hammocks into a fun-house ride for a group of playful children. If the user decides to lie in the hammock lengthwise, it spreads out naturally for shoulders and hips, making it generally a more comfortable place to sleep. Speaking of children, here is a hammock that is designed to encourage little ones to sleep on their backs without any of that worrisome flipping and spinning. The striped cotton hammock is gathered onto a wooden support at each end of a rocking support. Perfect for toddlers and preschoolers who like to have a place to rest and play near parental or caregiver works spaces. The hammock has just enough “give” to create a snuggly cradle and the rocker is perfect for foot rocking while the adult watching over the little one is busy with other things. With that said, NCBI recommends that infants should not sleep unsupervised in a baby hammock for a variety of safety reasons. This is another hammock that does not have a spreader. The support frame is very similar to the one for the No-spreader Hammock, in that it has adjustable hangers, so the user can determine how low or high to string the hammock. It can easily be sat on sideways or lain across instead of lengthwise. It has a support capacity of 400 pounds and can be occupied by two adults. The soft, cotton fabric encourages comfortable lounging and the wide width makes it easy to add a pillow or two and a soft throw. Easy to take apart and put together for portable comfort. If you plan to take a hammock for winter camping, this is a better choice than a mesh hammock because it will be easy to add a pad or woolen blanket under your sleeping bag. This traditional cotton net hammock comes with a tan, yellow, green, red and white striped quilted hammock pad to help you nap without hammock weave “tattoos” upon waking. Both ends of the hammock have spreaders. The chains, hooks and hammock stand needed to suspend the hammock are included. The hammock is designed to support up to 275 pounds. With the stand, the unit weighs 40 pounds, making it a little heavy for backpacking, but fine for auto-travel camping. It is easy to set up and can be used indoors or out. This neat little number comes with a telescoping aluminum hanging frame that can easily attach to your backpack along with your bedroll. The canvas hammock is reasonably comfortable, especially with a sleeping bag stretched out on it. It weighs in at 20 pounds, so it isn’t exactly light, but not as heavy as some of the other stands. It has its own carrying case, so could easily be stored in a closet to use as a spare bed or stashed in the garden shed to be brought out with the regular garden equipment. While not as attractive as some of the more colorful hammocks and perhaps not quite as cozy, it is still a serviceable item. If you are looking for the perfect place to relax with your sketch pad or book, this is the spot. While hammocks can tip or spin, this is a solidly framed seat that can be even be tethered to the frame to prevent swinging. It is perfect for a poolside or garden lounge. The shade makes it easier to avoid excessive sun exposure, especially that glare on the text of your favorite novel. It is not, however, for larger adults – weight capacity is 120 pounds. It arrives with some assembly required. The pad matches the sunshade. For a petite person or an older child, it can provide excellent garden, patio or poolside seating. If you are tired of the standard folding chairs for outdoor camping equipment, you will love this chair hammock with stand. The striped fabric sets a bright holiday mood, and the cushions will be a welcome change from metal or plastic seating. The hammock will hold up 256 pounds. It does not come with a C-Stand, although it can be used with one. It can also be hung from a tree limb or child’s outdoor gymnasium set up. It can also be purchased as a combo, in which case it does come with the stand. Designed for outdoor use, this small mesh nylon hammock is intended to brave the elements. The synthetic materials will hold up to weather, and the metal frame is powder coated for extra protection against rust and other types of weathering. An excellent choice for the beach, your poolside, or garden side quiet spot. The feet are not well engineered for indoor use, but in a pinch, you could put carpet squares under them and use it as an extra bed. Designed to be practical and functional, its comfort might be improved with a quilted pad placed in the hammock. Hammocks are usually a mesh or a length of fabric that are hung either horizontally or suspended from above. They are usually porous, either because they are a woven mesh material or because they are made from cotton or a similar material that will breathe. They can be for one person, or two. They might have a wooden or metal “spreader” bar that will make the hammock lie flat instead of rolling up. Some models have a spreader bar at both ends, some only at one end. Spreader bars have the unhappy characteristic of making the hammock “tipsier.” One way to get around this is to attach tethers to the ends of the spreader bars to stabilize the hammock and keep it from flipping over. Another way is to invest in a hammock that does not have spreader bars. The latter tend to cocoon the occupant, but correctly hung, have more “give” and yet more support all at the same time. A third type is really more of a suspended chair. The ends of the hammock chair are suspended from above, allowing it to be used as a chair. Hammock frames are usually long affairs that allow the hammock to be fastened at two points so as to allow people to anchor each end of the hammock. The frames might be made of a weather resistant wood such as larch or cedar but are frequently made of metal. The metal is often powder coated for extra weather resistance. Some of the frames have special fasteners to help prevent hammocks from flipping over. Others, constructed for hammocks without spreaders, have more than one hook per end for the hammock to be fastened at variable heights, and U rest for the support threads at the end of the hammock. As you might guess from the name, hammock chairs are primarily intended as seats rather than a place to nap although some of them are sufficiently large to stretch out on. They usually are suspended from a C-Frame that allows them to be placed in different locations without difficulty. There are many fabric choices for hammocks. Some are no more than a woven mesh, some are cotton, some are more durable versions of cotton such as cotton duck or canvas. A popular fabric for hammocks without spreaders is parachute cloth, which is durable and often colorful, as well as being light. When purchasing a hammock, there are many things to keep in mind. One of the foremost is its purpose and whether you will be using it for more than one season. If you only need it for a short while, such as a single camping trip, you might easily be able to get away with an inexpensive emergency kit hammock. But if you hope to reuse the hammock or if it will be prominently displayed in your garden, patio or sunroom, then you will probably want something a little more upscale and comfortable. That is where the beautiful wood frames come into play, or even the more modest metal ones, along with colorful cotton or synthetic fabrics. Always check the weight allowances on hammocks, especially if you hope to invite a second person to share it. It can be pretty embarrassing at the least to have your hammock tumble down because you subjected it to more weight than that for which it was rated. Check the feet if you plan to use a frame and hammock indoors. Some are better suited to indoor use than others. Hammocks are not recommended sleep platforms for infants, even though they can be a fun place for an older child to relax and play. If you want to use your hammock for winter camping, you will want a good insulation layer on top of the hammock and under your sleeping bag. A woolen blanket folded in half lengthwise will work well. It is a good idea to bring cloth hammocks indoors for the winter, even if they are rated weather resistant. The fabric will last longer and will be less likely to fade. If the frame is too large or heavy to easily put away, covering it for the winter is a good idea.